Find artworks, auction results, sale prices and pictures of Périclès Pantazis at auctions worldwide. Périclès Pantazis (Greek, 1849-1884) Yellow Roses signed 'Pantazis' (lower right) oil on canvas 50 x 41.5 cm. Footnotes Provenance Galerie Georges Giroux, Brussels, auction no. 128, 17 March 1934, lot 132. Palais des Beaux-Arts, Brussels, 5 December 1990, lot 744. Private collection, Athens. Literature O. Mentzafou-Polyzou et al., Pericles Pantazis 1849-1884, Evangelos Averoff-Tositsas Foundation, Athens 1994, no. 167, p. 210 (catalogued), p. 121 (illustrated). Against a scumbled dark green backdrop wall, comparable to still lifes by Chardin and Boudin, Pantazis juxtaposes an evocative bouquet of roses placed casually in an unadorned vase. 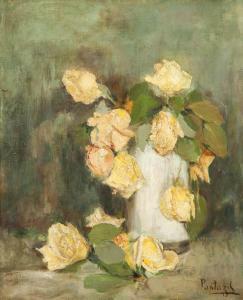 Relying on rich, confident brushwork, tactile texture, careful tonal gradations and a restricted palette limited to tones of creamy yellow, peach, pale rose, white and green (recalling Monet's Two Roses on a Tablecloth, 1882-83, in the Museum of Modern Art, New York)1, Yellow roses is an intimate Pantazis, boldly capturing the essence of its subject. Deeply and inventively engaged in the indoor art of still life, Pantazis skilfully combined acute observation with purely pictorial values, producing a masterly effect of objects seeming at once weight-bound and floating in space. 1. See Impressionist Still Life, exhibition catalogue, Museum of Fine Arts, Boston 2002, pp. 144-145. Périclès Pantazis (Greek, 1849-1884) L'enfant au chemin de fer signed 'Pantazis' (lower right) oil on canvas 71 x 101 cm. Footnotes Provenance 12 May, 1885, Auction of the P. Pantazis Atelier, Salle Sainte-Gudule, 9 rue du Gentilhomme à Bruxelles (under the title L'enfant jouant). 1885, Léon Gauchez (1825-1907) collection. 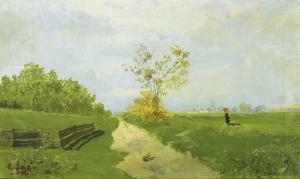 3 May, 1924, Galerie Georges Giroux, n. 61 (under the title L'enfant au chemin de fer). 7 December, 1925, Galerie Georges Giroux, Auction of The Jean Renard collection, n.83, illustrated p.22 (under the title L'enfant au train). Private collection, Belgium, since 1925. Exhibited Literary and Artistic Circle of Brussels, 1879. Literature P. Colin, La peinture en Belgique depuis 1830, p.314, n. 302 (illustrated). 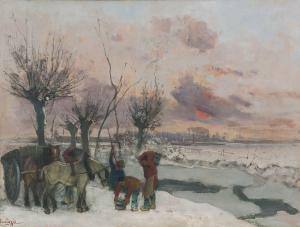 (mentioned as L'enfant au chemin de fer, private collection) The sketch of this painting, belonging to the old collection P. Colin, is kept at the Sint-Niklaas Stedelijk Museum in Belgium. 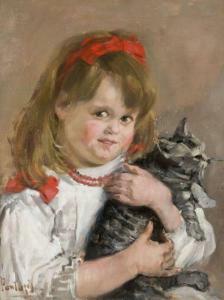 This pantings is also knows under the title Enfant jouant. It was in 1871, at the beginning of his career as a painter, that Pantazis executed his first painting with a child as subject. Since then he has continued to exploit this theme, endlessly varying the poses, the layouts and, above all, the lighting games, so that the motif of childhood and that of landscape represent the two major themes of his oeuvre. In a letter, dated 1874, from the artist to his friend and patron, the Greek merchant Economos, Pantazis expresses his interest in the mischievousness, intelligence and gentleness of children: "a fascinating subject," he writes, "which will never weary me never as a painter ". Pantazis attached great importance to L'enfant au chemin de fer. It is not a coincidence that in 1879, during his second solo exhibition at the "Cercle Artistique et Littéraire" in Brussels, he chose this work in the prime place of the seven paintings he exhibited. A solo exhibition at the Artistic Circle, during the lifetime of the artist, was a rare and prestigious honour. Pantazis' first solo show took place in 1878 and the second one in 1879. Aside from this Greek artist, only Courbet and Rodin, had the priviledge of exhibiting individually and on several occasions at the ceremonies of this Circle. It is following these solo exhibitions that Pantazis' oeuvre is first noticed by the most notorious art critics and his fame goes beyond the limited framework of Belgium. Paul Lefor, of the Gazette des Beaux-Arts, edited in Paris, for example, pronounced himself in favour of Pantazis by situating him in the tradition of Impressionist painters: "Mr Pantazis, who lives in Belgium, writes, and sometimes exhibits in Paris, follows the traditions dear to the Impressionists. "This is the first time that a Greek painter linked to Impressionism. J-K Huysmans, art critic, renowned for the accuracy of his remarks and the sharpness of his judgment and defender with Zola of the impressionist painters also makes the comparison on the occasion of the same exhibition. He writes: "Mr Pantazis should be among the French Impressionists. This one is a painter, audacious, sincere, a researcher ... .. ". L'enfant au chemin de fer was painted in 1879, when impressionism in France reached its maturity. Pantazis took a close interest in this: he liked Boudin, Manet and Monet, but did not forget Corot, Courbet and Artan. However, decomposing and flickering Impressionism was hardly tempting to him. He remains faithful to the coherence of natural structures and the continuity of forms and plans. In this painting, the plunging view notably strengthens and extends the pictorial space. 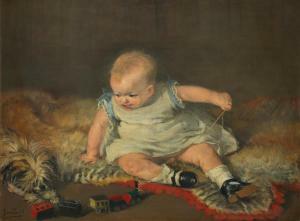 The blows of the quivering brushes delineate the forms well and render with an expressiveness underlined by the face of the child, at once radiant and mischievous; absorbed by the game.This work exposes the true pleasure of a portrait artist, and never had he felt it more intensely or expressed it with more happiness than in this scene in which all of his most rare qualities are observed. Pantazis liked to take, according to contemporary sources, both quick sketches and more accomplished drawings. The museum of the city of Sint-Niklaas in Belgium has a beautiful sketch of L'enfant au chemin de fer in its collection. But definitely, this definitive painting is more advanced. He combined the inimitable care and freshness of the sketch with the care and attention of a painting executed calmly and methodically. It is the combination of these two strengths that the artist has been able to harmonize and in such a way to obtain small masterpieces. It is certainly for this same reason that in 1930 Paul Colin, in his major book Belgian Painting Since 1830, considers L'enfant au chemin de fer among the masterpieces of this period and confers on Pantazis, the same place as James Ensor, Theo Van Rysselberghe, or Félicien Rops. This piece was written in French by the art historian C. Economides. We are grateful to Stephanos Samaras for his assistance in the cataloguing of this work. 75 by 100.5cm., 29½ by 39½in. The canvas has been strip-lined along the four tacking edges. Ultraviolet light reveals a few small areas of retouching, notably: one circa 3 by 5cm (patched on the reverse) and another adjacent circa 3 by 4cm area in the lower right quadrant, a circa 2 by 4cm area of retouching in the figures' feet in the lower centre (also patched), and some small spots above the signature. The painting is overall in good condition. Held in a decorative gilt frame. 33,2 x 55,4 cm ; 13 x 21 ¾ in.